Sometime tomorrow, Lamborghini is expected to reveal the new Huracán LP610-4 Super Trofeo and kick off a new era for its spec racing series. But before it does, a videographer on the ground going by the handle Carspotter Jeroen has released this clip of the latest Lambo racer preparing for its closeup. Based on the road-going Huracán, the new Super Trefeo packs track-specific aero, additional cooling vents and intake ducts, competition-spec rolling stock and a stripped-out cockpit with a single racing bucket. It’s a similar transformation which arch-rival Ferrari applies to the 458 Italia to turn it into its Challenge racer. Previewed in a series of teasers, this Huracán racer will form the backbone of the Lamborghini Blancpain Super Trofeo series, initially creating an additional class until the previous Gallardo-based racer can be phased out. Watch this space for further details and the video clip in the meantime. 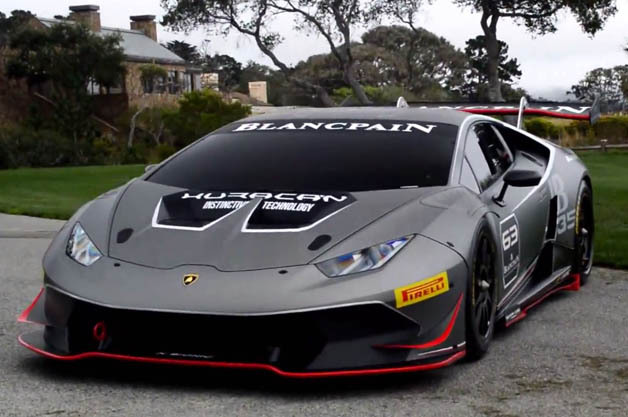 Lamborghini Huracán Super Trofeo surfaces in Monterey originally appeared on Autoblog on Thu, 14 Aug 2014 11:30:00 EST. Please see our terms for use of feeds.